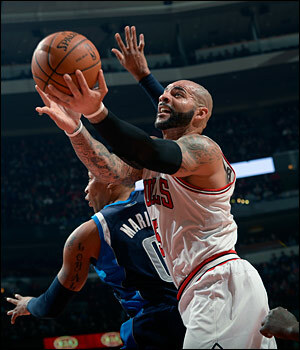 So how bad was it for the Bulls Saturday at the United Center in a 105-83 loss to the Dallas Mavericks? It was so bad Vince Carter deserved to have a nickname again and Shawn Marion deserved credit. The two oldest Mavs with a combined 29 years in the NBA and working on near career low seasons and their Social Security applications became dominant players for a night, Marion with a game high 13 rebounds and 14 points, Carter off the bench with 18 points and as many made threes as the entire Bulls team. They supported 22 points from Monta Ellis to lead one of the league’s worst defensive teams to a 32-point third quarter lead after blowing the game open by halftime with a 61-34 margin. Heck, Dirk Nowitzki with the elevation of Chris Christie blocked as many shots as the entire Bulls team. Celebrating a two-game winning streak? Yes, this is a different season. Not exactly, but teams like the high scoring Mavs are just too much for this offensively challenged Bulls group, which again played without Luol Deng out with an Achilles injury and saw Jimmy Butler limp through much of his 45:43 of playing time after aggravating his turf toe injury. Though limping to his chair following a shower afterward, Butler, who had 11 points but a career-high seven turnovers of the Bulls 18, said he would be fine and ready to play Monday in Memphis. Yes, a Western Conference team. But one of the few that can’t score. This was the Bulls more at 10 percent compared with a 100 percent Mavs team, now 17-13 and eighth in the Western Conference while the Bulls remained ninth in the Eastern Conference at 11-17. Noah usually doesn’t cut off interviews that sharply. But there was not much more to ask and not much more to say. Yes, that’s it, folks after a game like that. The Bulls are 1-7 against Western Conference teams with the only win over the Jazz at the United Center when the Jazz was on the way to a 1-14 start. The Jazz then beat the Bulls in Salt Lake City. The Bulls with injured players returning and D.J. Augustin giving them a boost in the backcourt were feeling like they were coming back with two straight wins with the Christmas Day victory in Brooklyn. But the Bulls with Derrick Rose out all season and Deng out—their two top scorers—have to play at a relentlessly high level on defense and shoot a decent percentage to have a chance, especially against a prolific Western Conference team. The Bulls have lost their last three games to Western Conference teams by an average of 16 per game. Boozer and the Bulls are 1-7 against Western Conference teams with the only win over the Jazz at the United Center when the Jazz was on the way to a 1-14 start.. So it was going to take a strong effort, which just wasn’t there this night. 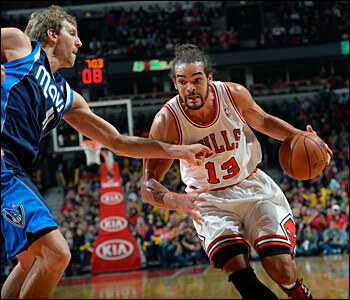 The Bulls did start off well with Noah shadowing Nowitzki in the principal point of the game plan. The Mavs don’t have a high scoring center. So Carlos Boozer played either Sam Dalembert or DeJuan Blair. And Butler was able to go after Ellis. It actually was working pretty well as Noah was up aggressively on Nowitzi, who missed his first three shots while Butler was harassing Ellis. It was 17-15 Bulls after a Noah slam dunk on a slick Boozer pass and steal by Butler from former college teammate Jae Crowder and layup when the Bulls made substitutions and the Mavs countered well. Mavs coach Rick Carlisle is quietly not only one of the best coaches in the NBA, but he’s a master of creating matchup advantages and exploiting them. The Bulls have been trying to limit Kirk Hinrich’s playing time given recent injuries. So they went with Augustin and rookie Tony Snell. But Carlisle saw an immediate edge, forcing Butler off Ellis as Dallas went without a point guard. That put the smaller Augustin on Ellis, and Ellis immediately went at Augustin and the basket. Thibodeau gets criticized at times for not substituting enough. But he was trying to use the players he had. Initially the Bulls collapsed on Ellis—collapse being the operative term for this in the next several minutes—and Ellis found Carter for a three. Then Ellis drove at Augustin for six points and Carter closed the quarter with another three with Butler racing inside to help and again unable to get back. That gave the Mavs a 30-19 lead after one quarter. And then they poured it on to open the second quarter when Thibodeau went to his bench with a lineup of Snell, Gibson, Augustin, Butler and Nazr Mohammed and the Mavs pushed their lead up to 39-21 in the first three minutes. This one was getting away. Thibodeau drew a technical foul for a disagreement with the officials and then players began a bit of carping as well. Augustin, who continued his good offensive play and shooting with 11 points, finished off a fast break on a Hinrich steal and then added a three to get it down to 44-28. The Bulls had been having success with Hinrich and Augustin in the backcourt. But the Mavs began to make threes and just about everything else, going on a 15-2 run as the Bulls helped with a plethora of quick jump shots and suddenly it was 59-30 Mavs with a minute left in the first half. And this isn’t the kind of Bulls team that comes back from 30-point deficits. Plus, Carlisle never gave the Bulls a chance to get much going. Anytime they had even the smallest run in the first three quarters, even with two or three scores in a row, he’d call timeout. The Mavs then scored every time—seven of them—in the first three quarters when they came out of timeouts with the ball. But with Vince Carter and Shawn Marion?